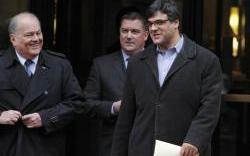 Former CIA officer John Kiriakou, right, is accused of leaking classified documents to the news media. Former CIA intelligence officer John Kiriakou was charged today with repeatedly leaking classified information to journalists — including the names of covert officers and their involvement in the capture and interrogation of terror suspects. According to the Department of Justice’s criminal complaint, the 47-year-old former officer allegedly confirmed or disclosed personal information about two fellow CIA employees to reporters in email exchanges between 2007 and 2009. The Justice Department complaint alleges this information was then provided to the defense team representing high profile prisoners at Guantanamo Bay. The 26-page complaint points to a June 2008 New York Times article that publicly identifies a covert CIA officer involved in the capture of suspected al-Qaeda operative Abu Zubaydah. It claims Kiriakou provided the Times reporter with the officer’s email address and phone number and confirmation of the officer’s involvement in the agency’s capture, detention and questioning of terrorism suspects.The complaint also mentions that due to the identifying information provided by Kiriakou, the terror suspects’ defense team was able to obtain identifiable photographs of CIA officers allegedly involved in the interrogations. After publication of the article, Kiriakou denied that he was the source in email sent to the officer named in The New York Times. Kiriakou, of Arlington, Va., worked for the CIA from 1990 to 2004. He faces four criminal charges, including violating the Intelligence Identities Protection Act, the Espionage Act and for making false statements to the CIA Publications Review Board for a book he published, according to the press release.